Why does “future” matter to a city at all, especially to a city like New Westminster which may not be marketing itself to attract hi-tech companies for its tax base or knowledge workers for it’s economy – however, as a small city that is home to a community college, a call centre, a large high school and a burgeoning population of young families, a sense of “future identity” is vitally important. It goes beyond teens and young families feeling that there is potential for their own future here in the Royal City, it has to do with how people view the potential of their community. Humanity has always associated “the future” with a sense of optimism and possibility, and without those sentiments being demonstrated in a community, where is the motivation to stay, to invest, to participate and enjoy? I work for a research group which recently concluded a project about the role of maternity care services (family doctors practicing obstetrical care, midwives, and surgical backup services) in the sustainability of rural communities in BC. Not surprisingly, we found that the loss of maternity care services threatened the viability of rural communities. Without maternity care services, employers couldn’t attract workers with families, and families already living in these communities often left because they felt that their own family’s future and the future of the community were incompatible. What a good example of how vital a sense of community “future” is to viability of that community long-term… The key being that if people don’t see their own futures in the future of their own community, they are less likely to move there, stay there, or invest themselves in that community. In a city with such reverence for history but no real “future identity” we risk giving the impression we are simply treading water, dwelling on the past in an age when the future seems to arrive faster than we expected. Envisioning a city’s future is not solely the domain of younger generations – if you are among our city’s elders, your contributions and service to this city are the seeds which will grow the city’s future. It’s your investment. How will it be used? It seems that New West has always had a devoted following of citizens who’ve loved and served the community, and worked to preserve it’s beauty and history… isn’t it the perfect time now, during the 150th Anniversary celebrations, to ensure that New Westminster’s role in the future, and the hard work of many people to get us there, is imagined, honored, and celebrated. Last night we talked about how we might celebrate New Westminster’s future, looking ahead from our 150th Anniversary celebrations to the years to come – at Tenth to the Fraser, we invite you to join us in envisioning the future of New Westminster and dreaming up ways to celebrate it in our community. It would be easy to assume that celebrating “future” involves throwing a couple hundred dollars at the local high school student council and telling them to make it very “internet-y” (although we ARE VERY excited about the upcoming public civic wi-fi! ), but it’s more than that. What do we want/expect/imagine New Westminster will look like years down the road… and how do YOU think we should celebrate it on this important year? This is a guest post by Nancy Gephart from Clever Mink’s Gifts, ‘the minksiest gift shop in the Lower Mainland,’ at 711 Carnarvon St.
1) Pick up a free Passport at any participating business (I have them here at Clever Mink’s Gifts) or at any of the locations listed on Tourism New Westminster’s website. 2) Have your Passport stamped when you visit the many participants around town. You’ll be surpised by how many there are! There is no hurry, the Passport is valid until October 15. Almost all of the participants are offering a discount or promotional goody when you present the Passport for stamping. 3) On October 16 enter your stamped passport into the drawing for prizes (with 25 or more stamps). This is a wonderful opportunity to shop, dine, and play locally. And it is a really good excuse to do the “tourist” thing in our own city. As New West celebrates its sesquicentennial, why not venture out and see how many stamps you can collect over the summer. The Passport also has a handy Calendar of Events. And did I mention the discounts? Sweet! In a press release today, the City of New Westminster announced it has received a $200,000 grant from the federal government towards the city’s planned 150th anniversary celebrations this year. The money will offset the $374,000 budget council approved earlier this year to plan and promote the events. You can see the official list of planned 150th anniversary events at newwest150.ca. We have also included them in our regularly updated New Westminster and area event calendar. Highlights include a heritage fashion show, a community picnic on City Hall’s front lawn, and a trolley tour of New West. New Westminster loves not only a parade, but events in general. Today’s ‘royal’ tea at Century House was no exception. The place was packed and the event sold out, with Mayor Wayne Wright and New West city councilors, MP Dawn Black, Poet Laureate Emeritus Edna Anderson, Salvation Army Captain Dave MacPherson, and Qayqayt First Nation Chief Rhonda Larabeeall in attendance. 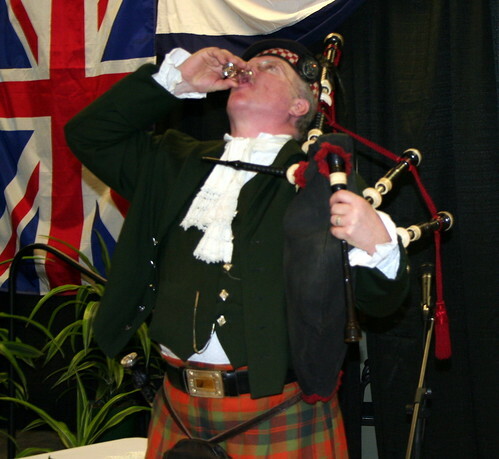 After being piped in, the pipers were paid and Master of Ceremonies Don Andrews introduced the mayor, who welcomed the crowd to the kickoff event for a year of celebration to commemorate the proclamation of New Westminster as British Columbia’s first capital in 1859. ‘Celebrating Our Past, Embracing the Future’ is the theme for the year (one tiny quibble, Embracing Our Future would really sound better – wouldn’t it?). 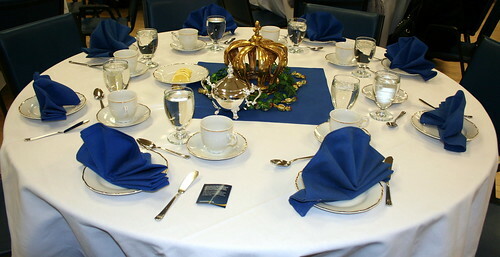 And the event organizers did a bang-up job of making Century House look beautiful, with golden crowns as centrepieces on every table and silver-plated tea services everywhere. 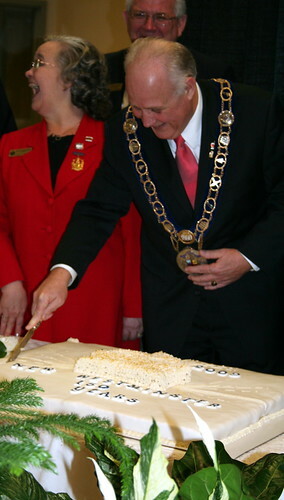 After walking the gauntlet formed by the Royal Knights and the May Queen Suite, members of the Royal Engineers Living History Group attended while Governor James Douglas read the proclamation officially naming the site of what is now New Westminster as the capital of the Colony of British Columbia on February 14, 1859. Miss New Westminster 2008 and the 2009 Hyack Ambassador candidates shared a very small stage as they took turns presenting anecdotes from 1859, including a short speech about Caroline Kennedy, one of the first non-aboriginal women to live in New West and another about W. J. Armstrong, the city’s first merchant. After opening a general store, Armstrong went on to become sheriff and justice of the peace. 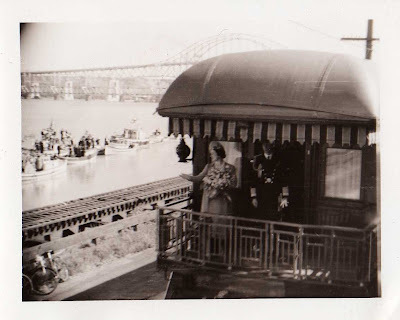 After an enthusiastic round of God Save the Queen (who chose the city’s name because Westminster was her favourite part of London), the tea began. There were the usual fancy sandwiches, mini scones, and pastries. And then, of course, there was cake. We must have seemed hungry, because the catering staff kept dropping off more plates of sandwiches – and more pots of tea. I was particularly fascinated to hear Rhonda Larabee speak. I had never heard of the Qayqayt First Nation before, and it was moving to listen to her talk about her people’s original village site on the banks of the Fraser, and the creation of three reserves after the Royal Engineers began building the city. These reserves – located at the old Scott Paper plant, Bridgeview, and the burial grounds on Poplar Island – were all closed in 1916, and Qayqayt First Nation now comprises only 48 people and is the only First Nation in Canada without a land base. “We are the River People,” said Larabee, who successfully established that the Qayqayt were not extinct and launched a claim to regain her Indian status in 1994. A city that remembers its past will hopefully not be doomed to repeat it. As New Westminster enters an era of rapid population growth* in uncertain economic times, I hope the spirit of inclusiveness that seems to prevail here will be one of the things we choose to preserve. * The city estimates New Westminster will have 84,000 residents by the year 2021, although other sources put that figure as high as 88,000. The Backroom Theatre Club is issuing a Call for Plays to the many playwrights in New Westminster to write short play vignettes, of about 10 minutes duration, on any New Westminster history theme of their choice. 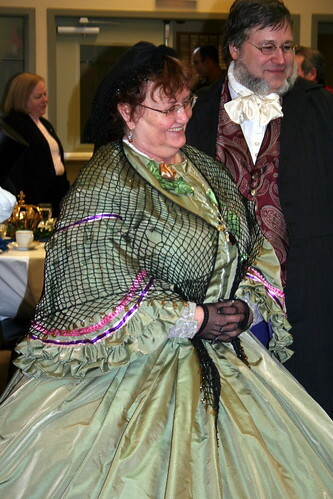 These vignettes will be produced throughout 2009 to celebrate New Westminster’s 150th anniversary. It is expected that the vignettes will provide theatrical snapshots of what life was like in New Westminster in the past 150 years. If you’re interested, call the Backroom Theatre Club at 604.523.1523 or 778.868.2254. You can also watch the New Westminster Arts Council website for more details as the project progresses.